He was a handsome gentleman, well built and tall . . . who was always exquisitely dressed and well perfumed—in peacetime and in wartime—right down to the saddles of his horses. Titian's Portrait of Alfonso d'Avalos, painted in Bologna in the winter of 1533, signals the inception of one of the most influential prototypes in the history of Western art-the standing state portrait. 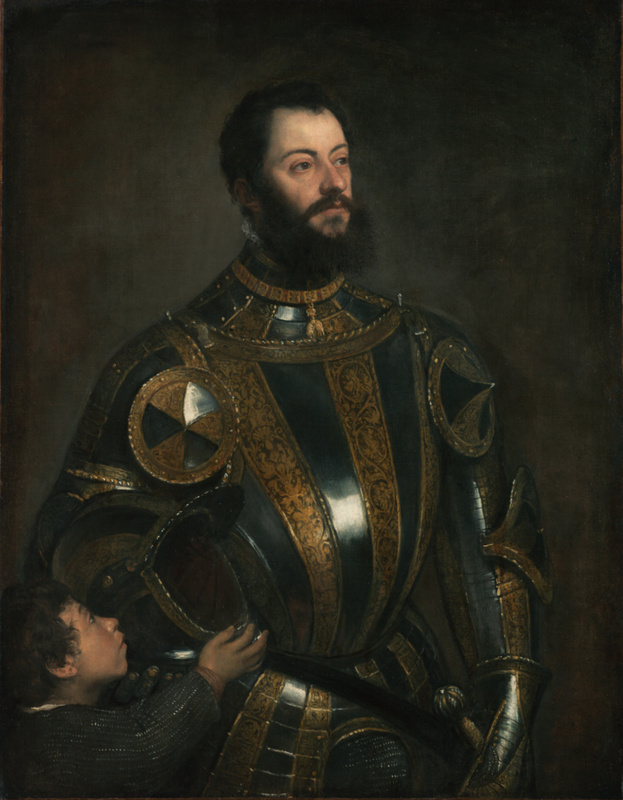 Dressed in armor with a diminutive page looking up to him, Alfonso d'Avalos exudes the tremendous power he wielded as governor of Milan and commander general of imperial forces in Italy under the Holy Roman Emperor, Charles V. As the Abbot of Brantôme—a French historian—observed, Avalos was a man who took great care with his appearance. He was born into an illustrious Spanish-Neapolitan family and trained for a military career under his cousin, Ferdinando Francesco, the Marchese di Pescara. After winning numerous military campaigns, Avalos was honored with the Order of the Golden Fleece. He is shown wearing the Order's royal collar over an elaborate and beautifully wrought suit of armor befitting an imperial leader. In the lower left, his page hands him a helmet. Titian endowed him with all the earnestness of a learned and contemplative man, while at the same time conveying his authority. Alfonso d'Avalos d'Aquino, sixth marquis of Pescara and second marquis of Vasto, 1502 - 1546, by inheritance to his son, Francesco Ferdinando d'Avalos d'Aragona, 1546. Francesco Ferdinando d'Avalos d'Aquino, seventh marquis of Pescara and third marquis of Vasto, 1531 - 1571, probably by inheritance to his son, Alfonso Felice d'Avalos, 1571. Stanislaw August Poniatowski, king of Poland, 1732 - 1798, possibly by gift to Stanislaus Augustus II Potocki. Count Stanislaus Augustus II Potocki, about 1751/1753 - 1805, by inheritance to Mieczyslaw Potocki. Mieczyslaw Potocki (Paris, France), by inheritance within the Potocki Family. Potocki Family, Polish, by inheritance to Felix Nicholas Potocki. Count Felix Nicholas Potocki (Paris, France), by inheritance to Alfred Potocki, 1921. Count Alfred Antoni Potocki, Polish, 1886 - 1958, sold to Martine-Marie-Pol de Béhague, 1925. Martine-Marie-Pol de Béhague, comtesse de Béarn, French, 1870 - 1939 (Paris, France), by inheritance to her nephew, Hubert de Ganay, 1939. Marquis Hubert de Ganay, 1888 - 1974 (Paris, France), by inheritance to his sons Jean-Louis, André, Michel, Charles, and Paul, 1974. André de Ganay, French, 1924 and Michel de Ganay, French, 1926 - 2013 and Charles de Ganay and Paul de Ganay, 1929 - 2009 (Paris, France), sold to AXA Oeuvres d'Art, 1990. AXA Oeuvres d'Art (Paris, France), sold through Didier Aaron (Paris, France) to the J. Paul Getty Museum, 2003. Vasari, Giorgio. Le vite de' più eccellenti pittori, scultori ed architettori. Gaetano Milanesi, ed. 9 vols. (Florence: G. C. Sansoni, 1878-85), vol. 7 (1881), pp. 441-42. Wilczek, Karl. "Ein Bildnis des Alfonso Davalos von Tizian." Zeitschrift für bildende Kunst 63 (March 1929), pp. 240-47, ill.
Suida, Wilhelm. Tizian (Zurich and Leipzig: Orell Füssli, 1933), pp. 47, 77, pl. 131. Tietze, Hans. Tizian: Gemälde und Zeichnungen (Vienna: Phaidon, 1936), p. 340, under Paris, Comtesse de Béhague, fig. 124. Tietze, Hans. Tizian: Leben und Werk. 2 vols. (Vienna: Phaidon, 1936), vol. 1, p. 161; vol. 2, p. 306, pl. 124. Tietze, Hans. Titian: Paintings and Drawings (London: George Allen & Unwin, 1937), p. 339, fig. 24. Mayer, August L. "Quelques notes sur l'oeuvre de Titien." Gazette des Beaux-Arts 20 (December 1938), pp. 294-96. Hetzer, Theodor. "Vecellio, Tiziano." In Allgemeines Lexikon der bildenden Künstler von der Antike bis zur Gegenwart. Ulrich Thieme, Felix Becker, and Hans Vollmer, eds. 37 vols. (Leipzig: Seeman, 1907-50), vol. 34 (1940), vol. 34 (1940), p. 164. Tietze, Hans. Titian: The Paintings and Drawings (London: Phaidon, 1950), p. 34, fig. 122. Pallucchini, Rodolfo. Tiziano. 2 vols. (Bologna: Casa Editrice Prof. Ricardo Pàtron, 1953-1954), vol. 1, pp. 177-78. Doria, G., and F. Bologna. Mostra del ritratto storico Napoletano, exh. cat. (Naples: Palazzo Reale, 1954), pp. 15-16, no. 14, cover ill.
Dell'Acqua, Gian Alberto. Tiziano (Milan: A. Martello, 1955), p. 119, pl. 94. Le Cabinet de l'Amateur, exh. cat. (Paris: Orangerie des Tuileries, 1956), pp. 29-30, no. 99, pl. 23. Berenson, Bernard. Italian Pictures of the Renaissance: A List of the Principal Artists and Their Works with an Index of Places: Venetian School. 2 vols. (London: Phaidon Press, 1957), vol. 1, p. 190. Morassi, Antonio. "Titian." In Encyclopedia of World Art. 17 vols. (New York: McGraw-Hill, 1958), vol. 14, pp. 139-40. Braunfels, Wolfgang. "Tizians Allocutio des Avalos und Giulio Romano." In Mouseion: Studien aus Kunst und Geschichte für Otto H. Förster. Heinz Ladendorf and Horst Vey, eds. (Cologne: M. DuMont Schauberg, 1960), pp. 109-11, note 7. Valcanover, Francesco. Tutta la Pittura di Tiziano. 2 vols. (Milan: Rizzoli, 1960), vol. 1, pp. 33, 69, 108, pl. 144. Morassi, Antonio. Titian (Greenwich: New York Graphic Society, 1964), p. 30. Panofsky, Erwin. "Classical Reminiscences in Titian's Portraits; Another Note on His 'Allocution of the Marchese del Vasto'." In Festschrift für Herbert von Einem zum 16. Februar 1965. Gert von der Osten and Georg Kauffmann, eds. (Berlin: 1965), pp. 189-92, pl. 38.1. Shearman, John. "Titian's Portrait of Giulio Romano." The Burlington Magazine 107, no. 745 (April 1965), p. 173n16. Williams, Jay. The World of Titian, c. 1488-1576 (New York: Time-Life Books, 1968), pp. 124-25. Panofsky, Erwin. Problems in Titian, Mostly Iconographic (New York: New York University Press, 1969), pp. 74-75, fig. 82, n. 43. Cagli, Corrado, and Francesco Valcanover. L'opera completa di Tiziano (1969; repr., Milan: Rizzoli Editore, 1978), p. 113, no. 231, ill.
Pallucchini, Rodolfo. Tiziano. 2 vols. (Florence: G. C. Sansoni Editore, 1969), vol. 1, pp. 80, 272; vol. 2, fig. 242. Wethey, Harold E. The Paintings of Titian. 3 vols. (London: Phaidon, 1969-1975), vol. 2 (1971), pp. 22, 78-79, no. 9, pl. 56. Freedberg, Sydney Joseph. Painting in Italy, 1500 to 1600 (Harmondsworth: Penguin, 1971), p. 221. Béguin, Sylvie. Hommage à Titien, exh. brochure (Paris: Musée du Louvre, 1976), unpaginated, under "Un tableau d'une collection française", ill.
Wethey, Harold E. "Tiziano ed i ritratti di Carlo V." In Tiziano e Venezia: convegno internazionale di studi, Venezia, 1976 (Vicenza: Neri Pozza, 1980), p. 289, fig. 151. Habert, Jean. Le portrait d'Alphonse d'Avalos par Titien (Paris: Éditions de la Réunion des musées nationaux, 1990), pp. 7-17, ill.
"Une oeuvre maîtresse de la Renaissance italienne: le 'Portrait d'Alphonse Avalos' de Titien prêtée au Louvre." Revue du Louvre et des musées de France 40, no. 4 (1990), p. 263, ill.
Titian, Prince of Painters: Supplement to the Catalogue, exh. cat. (Washington D.C.: National Gallery of Art, 1990), pp. 2-5, entry by Jean Habert. Polignano, Flavia. "I 'ritratti dei volti' e i 'registri dei fatti.' L' 'Ecce Homo' di Tiziano per Giovanni d'Anna." Venezia Cinquecento 2, no. 4 (July-December 1992), p. 52, note 89. Fage, Gilles, ed. Le siècle de Titien: L'âge d'or de la peinture à Venise, exh. cat. (Paris: Grand Palais, 1993), pp. 158, 574-76, no. 166, ill., entry by Jean Habert. Leone de Castris, Pierluigi. I tesori dei d'Avalos: Committenza e collezionismo di una grande famiglia napolitana, exh. cat. (Naples: Castel Sant'Elmo, with Fausto Fiorentino, 1994), p. 48, under no. 8. Bernini, Rita. "La collezione d'Avalos in un documento inedito del 1571." Storia dell'arte, no. 88 (1996), pp. 396-97, 434, fig. 13. Ferino-Pagden, Sylvia, et al. Vittoria Colonna: Dichterin und Muse Michelangelos (Vienna: Kunsthistorisches Museum, with Skira, 1997), p. 85, under no. I.28, entry by Fernando Checa. Falomir Faus, Miguel. "'Felicissimi e destrissimi ruffiani in simil cosa': Alfonso de Ávalos, Hurtado de Mendoza i alguns aspectes de l'activitat artística veneciana entre 1539 i 1545." In De Tiziano a Bassano, exh. cat. (Barcelona: MNAC, 1997), pp. 15-16, ill.
Abbate, Vincenzo. Porto di Mare, 1570-1670: Pittori e Pittura a Palermo tra memoria e recupero, exh. cat. (Palermo: Chiesa di San Giorgio dei Genovesi, with Electa Napoli, 1999), pp. 116-17, fig. 6. Pedrocco, Filippo. Tiziano (Milan: Rizzoli, 2000), p. 154, no. 93, ill.
Checa, Fernando, et al. Carolus, exh. cat. (Toledo: Museo de Santa Cruz, 2000), p. 432, no. 229, ill., entry by Matteo Mancini. Checa, Fernando. "Tiziano y las estrategias de la representación del poder en la pintura del Rinacimiento." In La Restauración de El Emperador Carlos V a Caballo en Mühlberg de Tiziano, exh. cat. (Madrid: Museo Nacional del Prado, 2001), pp. 50, 53, 54, 56, ill.
Fletcher, Jennifer. "Titian as a Painter of Portraits." In Titian, exh. cat. (London: National Gallery, with Yale University Press, 2003), pp. 36, 188n40. Belozerskaya, Marina. Luxury Arts of the Renaissance (Los Angeles: J. Paul Getty Museum, 2005), pp. 168-69, fig. IV.38. Schaefer, Scott. Titian and the Commander: A Renaissance Artist and His Patron, exh. brochure (Los Angeles: J. Paul Getty Museum, 2005), passim. Costantini, Morena. "Les visages du pouvoir." In Titien: Le pouvoir en face, exh. cat. (Paris: Musée du Luxembourg, with Skira, 2006), p. 75, fig. 9. The J. Paul Getty Museum Handbook of the Collections. 7th ed. (Los Angeles: J. Paul Getty Museum, 2007), p. 100, ill.
Humfrey, Peter. Titian: The Complete Paintings, exh. cat. (Ghent: Ludion, 2007), pp. 146-47, no. 97, ill.
Ilchman, Frederick, et al., eds. Titian, Tintoretto, Veronese: Rivals in Renaissance Venice, exh. cat. (Boston: Museum of Fine Arts, with MFA Publications, 2009), pp. 210, 212, 301, fig. 94, entry by John Garton and Frederick Ilchman. Delieuvin, Vincent, et al., eds. Titien, Tintoret, Véronèse...Rivalités à Venise, exh. cat. (Paris: Louvre, 2009), pp. 237-38, fig. 108, text by Diane H. Bodart. Spinosa, Nicola. "Portraits of the Spanish Monarchy: From Titian to Francesco Solimena." In Painting of the Kingdoms: Shared Identities; Territories of the Spanish Monarchy, 16th-18th Centuries. Juana Gutiérrez Haces, ed. Vol. 4 (Mexico City: Fomento Cultural Banamex, 2009), pp. 1390, 1392, fig. 10. Allard, Sébastien, Nadeije Laneyrie-Dagen, and Emmanuel Pernoud. L'Enfant dans la peinture (Paris: Citadelles & Mazenod, 2011), pp. 124, 125, fig. 104. Park, Jeongho. Men in Armor: El Greco and Pulzone Face to Face, exh. cat. (New York: Frick Collection, 2014), p. 24, 37-38, fig. 10. Antonelli, Attilio, ed. Cerimoniale del viceregno spagnolo di Napoli 1503-1622 (Naples: Arte'm, 2016), pp. 241-42, fig. 65. Korkow, Cory. "Elegance Armed. 'Portrait of Alfonso d'Avalos' by Titian from the J. Paul Getty Museum." In Masterworks on Loan. Celebrating the 100th Anniversary of the Cleveland Museum of Art. First Quarter 2016 (Cleveland: The Cleveland Museum of Art, 2016), pp. 5-7, ill.